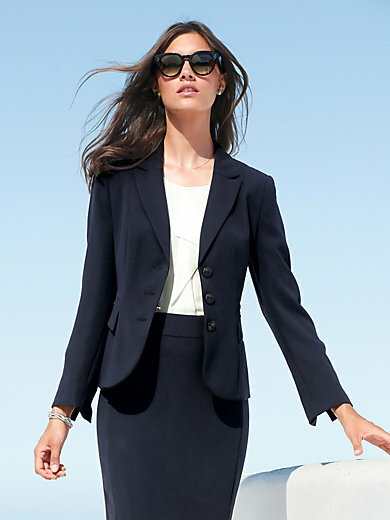 Blazer by Gerry Weber – modern 3-button design in a shorter style with 2 flap pockets with trim and sleeves with slits for turning up. Lining in 56% viscose, 44% polyester. Length approx. 60cm/24ins. Travel-appropriate mix-and-match fashion in a modern, classic cut by GERRY WEBER, perfect for wearing the whole year round. Made from extremely easy-care, crease-resistant and comfortable material. Whether a skirt or trouser suit: the perfect attire in trendy navy will leave you looking smart from morning to night – also when travelling or during long meetings. 100% polyester. The blazer is machine washable.